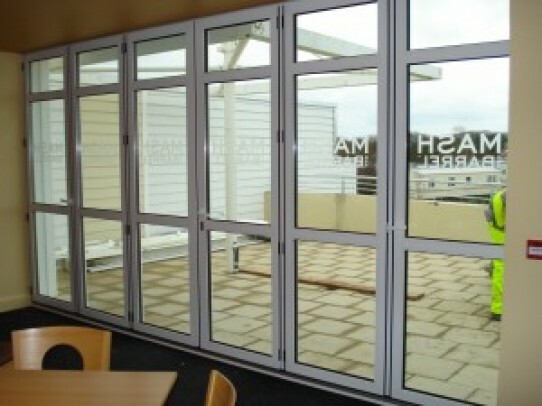 The folding glass doors designed, built and fitted by Combat Doors are so much more than just another set of doors. The sliding aluminium doors we build are a design feature capable of utterly transforming the space in which you live. The folding glass doors we create are as beautiful as they are practical, offering a wealth of design features which can be personalised by every individual customer. The finished product will be a talking point which blends in with your existing décor at the same time as offering something completely different. If you take a look at either our brochure or our website you’ll see the dazzling range of sliding aluminium doors we offer, as well as testimonials vouching for the quality of our work and the speed and convenience of our fitting procedure. The doors we provide can be fitted along an entire wall of your house, creating a space which is instantly lighter, larger and links the inside with the outside in a manner which conventional doors and windows can’t match. The fact that our sliding aluminium doors can be folded up to open the space completely means that the barrier between inside and outside can be instantly dissolved. Just slide the doors to one side and you can instantly enjoy good weather, eat and drink in the fresh air or simply allow the kids to let off some steam. Whilst looking beautiful and adding value to your home, our folding glass doors will help you to save on the heating bills by being built with thermally efficient glass, meaning that even the coldest weather can’t stop you enjoying the view. The frames holding our sliding aluminium doors in place are strong yet slim, keeping the windows in place stylishly and helping to create the impression of an entire sweeping wall of glass. Add in individual bespoke touches such as the choice of colour and the design of the handles and beading and you have a set of folding glass doors which, quite simply, you’re never going to see anywhere else. It’s not all about aesthetics, however, since our sliding aluminium doors are built to last and to handle anything that the weather outside or family life inside throws at them. As well as looking beautiful, the doors we create provide the highest levels of security and safety. The flexibility we offer also means that you don’t have to have a huge wall space in order to fit a set of folding aluminium doors. The range of different configurations we provide means that our doors can be fitted within a smaller space, with the added advantage that they’ll instantly make it seem much larger. If you’d like to transform your home by having our expert technicians fit an individually tailored set of sliding aluminium doors then contact us today and we’ll set about finding out exactly what you need and then supplying it. A survey and quote will cost you nothing whatsoever, and we’re convinced that once you’ve seen the quality or our folding glass doors and explored the range of options on offer, you simply won’t be able to resist taking the plunge.